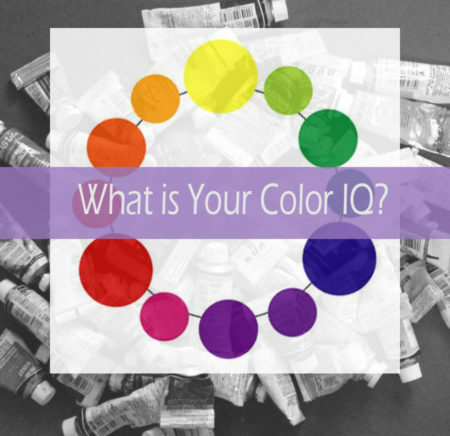 Did you take the color IQ quiz? If not, try it now at this page before taking at the look at the answers below. The answers to the color quiz which are highlighted in yellow. Further detail about each question and answer is under each question. 1. To mix a bright spring green, which yellow and blue would you use? It is important to know the results of mixing two secondaries because they often result in colors you may not want. Experiment mixing orange with purple, purple with green and green with orange. You just might be pleasantly surprised. I use these mixtures knowingly all of the time. By the way, the mixture of two secondaries, is called a tertiary. 3. 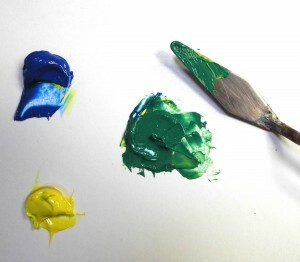 When cadmium yellow (orange-yellow) is mixed with ultramarine blue (red-blue), why is the resulting green a warm or olive green? Knowing the color bias of your primary colors is key to mixing the color you desire. The green mixture will be a muddier or duller green because the color opposite of green, which is red, is in both the cad yellow and the ultramarine blue. 4. Which of the below describes the attributes of each of the tubes of paint you own? b. A manufacturer’s unique properties, such as fluidity, thickness, etc. 5. To effectively tone down or de-saturate a bright pink, which color would you use? Pink is created using a blue-red with some white. Hence, the best green to use to tone it down is to use a blue-green or a green with a blue color bias. Nearly all of the blues available today are green-blues. Very few carry a red bias and I wish I knew why this is the case. 8. When mixing a pair of color opposites, the two colors are always a combination of all three primary colors. Let’s use orange and blue as our color opposites. Orange is created by mixing yellow and red. Hence, when you mix orange with blue, you are in fact mixing all three primary colors. The same is true when mixing yellow with purple and red with green. 10. If you want to draw attention to a bright blue shape in your painting, what is the most effective strategy or which color would you place next to it? This question is based on one of the color laws developed by Michel Chevruel in the early 1800’s. You probably know that color opposites vibrate when next to one another. We do not always want this vibration but we may want the blue to attract attention in our painting. Using its de-saturated color opposite does the trick. This is an effective painting approach to experiment with and we do so in my color class. Creating a sense of depth on a 2-D surface can be a challenge. There are several ways to achieve this using color as well as other design elements. More information on how to create depth in a painting is taught in my Craftsy course, “Acrylic Color Mixing Made Easy!” The principles apply for all media. 12. Why can’t you mix a vibrant purple using cadmium red with a blue? How did you do? Let me know and feel free to send me any questions you may have in the comments below. Would you like to end your frustration with color? 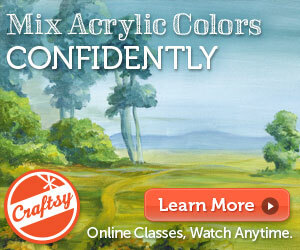 I adore teaching color live and via my Craftsy online video course “Acrylic Color Mixing Made Easy!” Though I use acrylics in this course, oil and watercolor painters have benefited as well. Color theory crosses all media! Here are a few unsolicited testimonials from this online course. 30 years as an art teacher and I’ve never seen a better explanation of color theory as you’ve presented here! 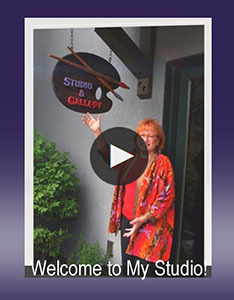 Best color class I ever took was with Carol A. McIntyre! Hi Carol, I’ve just discovered you. Your explanations of colour theory are easy to understand and so informative. Thank you very much for a fantastic learning experience! You’re a wonderful teacher. Thank you Carol for teaching me this. I have often been frustrated when mixing a color and it looks dull. Now all I have to do is remember which bias my paints are and then I should be able to deliberately mix a bright or dull colour. Thank you, thank you! Your class is wonderful and I’m loving it. I’ve never painted before in my life and it’s more fun than I ever expected! You now know your color IQ, do you know a painter who would like to take this color quiz? Please share this post using the buttons below. 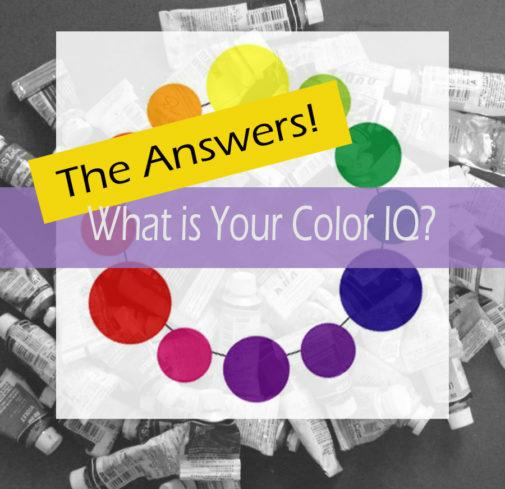 Artists, have you ever tested your color IQ?